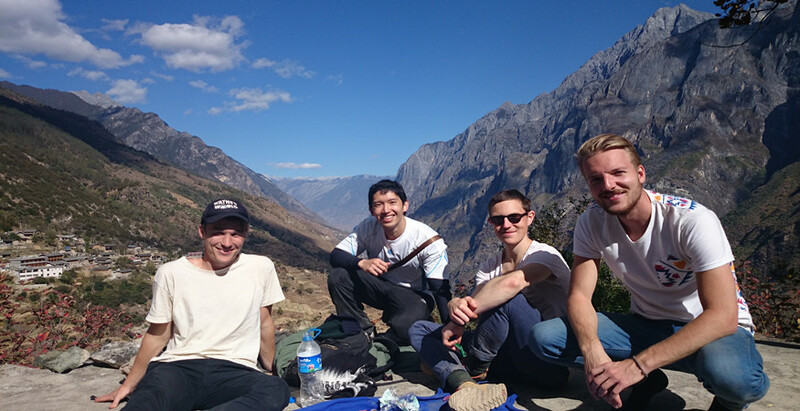 Tiger Leaping Gorge is recognized as one of the most famous scenic attractions for hiking in the world and one of the must-visit hiking itineraries in Yunnan recommended by ‘Lonely Planet’. It can not be missed if you like hiking. Besides this hiking as the highlight of this tour, we will also visit famous attractions in Lijiang and Shangri-La, such as the holy mountain-Jade Dragon Snow Mountain, Lijiang Old Town, and Ganden Sumtseling Monastery. It’s a special experience to visit local family and have yak-buttered lunch in their house. 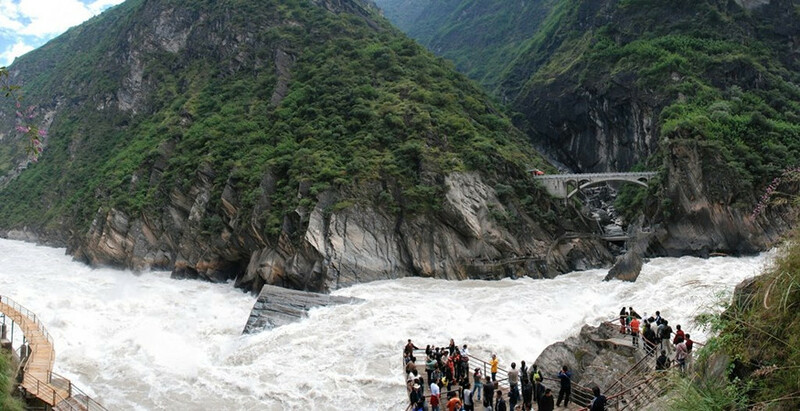 Hike along Tiger Leaping Gorge, as well as feel the grotesque and raging rapids of the magnificent gorge. Relax yourself in mysterious and charming Shangri-La and Lijiang. 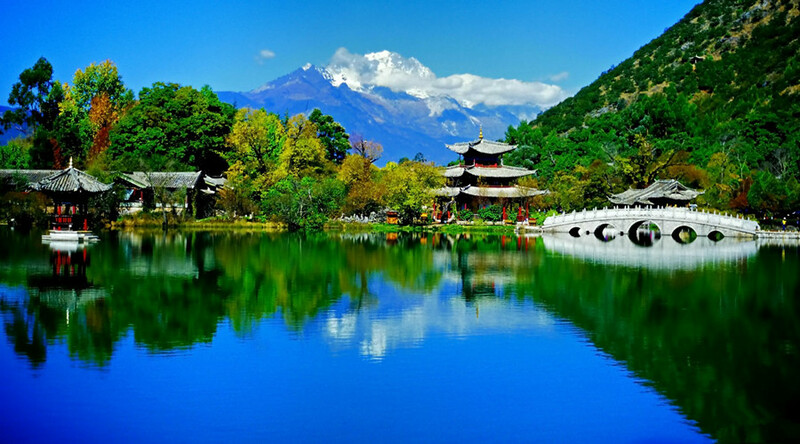 Visit the holy mountain in Lijiang-Jade Dragon Snow Mountain. Watch ethnic show by seating in front of the snow moutain. 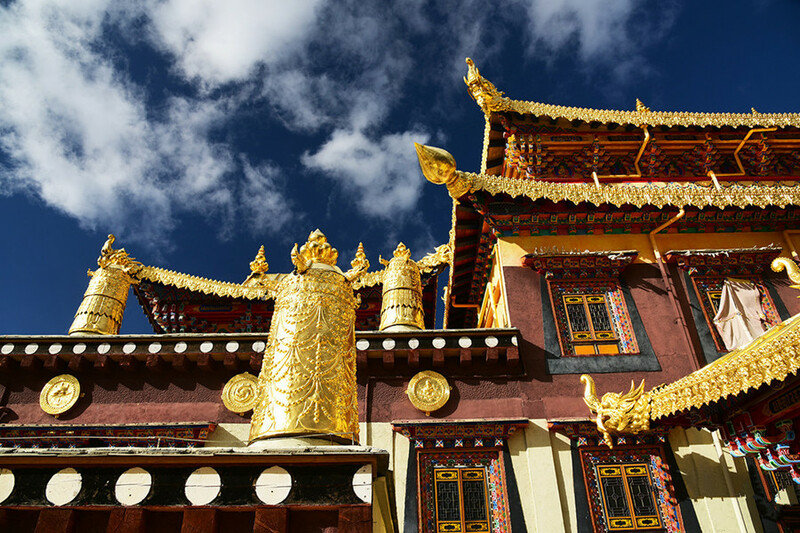 Pay a visit to a Tibetan family and have local cuisine. Arrive at Lijiang airport , then drive to Lijiang hotel for check in. In the morning, drive about 30KM to Ganhaizi Meadow(3100M), you will take the sightseeing bus for a short visiting through the Baishuihe River, take the chairlift up to visit Jade Dragon Snow Mountain. Take a cablecar to Spruce Meadow. You will hike around 1 hour in the original forest in Spruce Meadow (3200M). After lunch, you will have an option to enjoy the Impression Lijang Ethnic Show (Tickets:190 Yuan not included) directed in Ganhaizi Meadow(3100M). A cultural show demonstrating the traditions and lifestyles of the Naxi, Yi and Bai peoples of the area. The show takes place inside Jade Dragon Snow Mountain Park at 3500m in an outdoor theater specifically designed to showcase the mountain which is used as a backdrop. The production itself was designed by Zhang Yimou, Fan Yue and Wang Chaoge, a cast of over 500 people, and a number of horses. In the afternoon, you’ll stroll through Baisha Old Town, which is an enchanting traditional Yunnan town. Visit the Baisha Mural about 600 years old, which is one part of the World Cultural Heritage by the UNESCO 1997. Morning, you will head to visit Black Dragon Pool, enjoy the wonderful reflection view of the Jade Dragon Snow Mountain in the pool. Visit the Dongba Museum and explore the Naxi ethnic culture. At night, join in the singing competition party at the bank of ancient streams which wind through the town. Then go to stroll and enjoy the relax time in the Ancient Town of Lijiang, which is a largely Naxi settlement first built 800 years agao, located at the foot of the Lion Hill and completely surrounded by the new city of Lijiang. In December 1986, the State Council designated it a famous ancient historical and cultural city of national caliber. 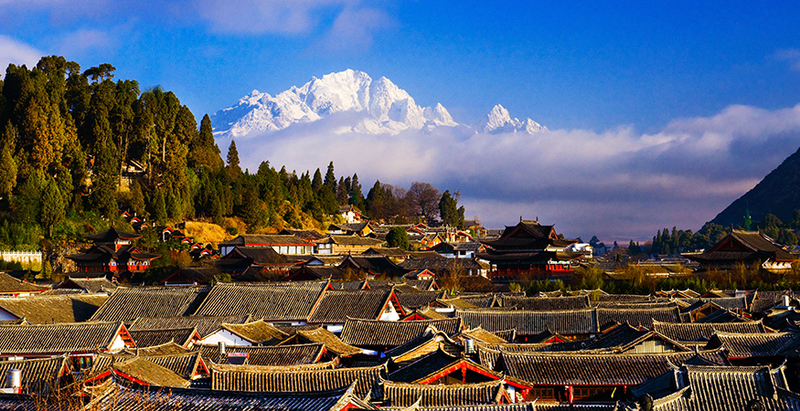 In 1997, UNESCO made Lijiang a World Cultural Heritage Site. In the morning, drive about 100KM to Qiaotou Town(Tiger Leaping Gorge Town). Drive along the Naxi ethnic villages and the upper Yangtze River, with a panoramic view of the First Bend of Yangtze River on the way. 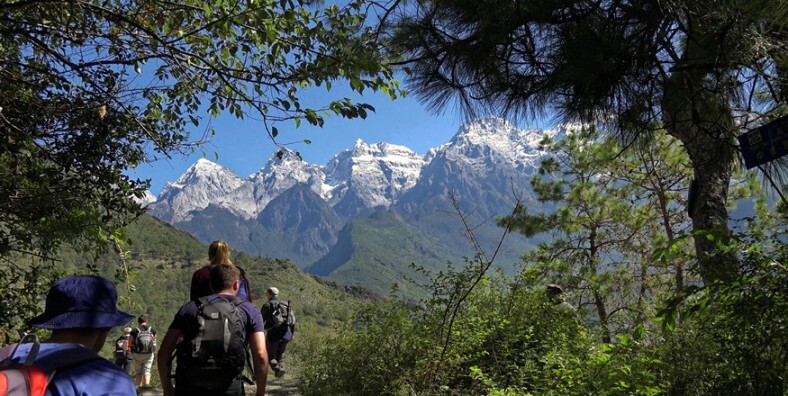 You will start the trekking of Tiger Leaping Gorge, as one of the world’s four great gorges, which is honored as one of the deepest and most marvelous gorge with 3900 meters in depth. Start the trekking form the Qaiotou Primary School, after half an hour, arrive in Changsheng Village, pay a visit to Changsheng Hope Primary School. Arrive in Zhong Nuoyu village at noon and have lunch in Naxi Family Guesthouse. After lunch, you will start the most difficult part of the trekking to the 28 Zigzag Bends trail and reach the top peak at the elevation of 2670m. You will arrive at Half-Way Guest House to finish today’s trekking. There is a nice platform on the roof of Halfway Guesthouse, after dinner, you will enjoy the wonderful Jade Dragon Snow Mountain facing to Bendiwan Village with couples of drinks. Note: While you are walking in the gorge, our support team will take all of your luggage to meet you at Tina’s Guest House, so you only need to carry two bottles of water, some chocolate and your camera on the trip. Get up in the early morning, hiking down to Tina’s Guest House, passing a small but high waterfall on the way. 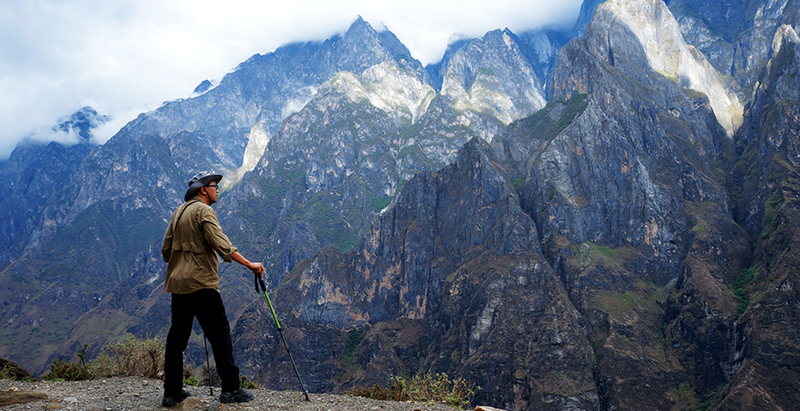 Then we will trek further down to the Middle Tiger Leaping Gorge and get back, which will take you about three hours. You will firstly trek from Tina’s Guesthouse down to Teacher Zhang’s Guesthouse, where you can have a nice view of the middle gorge looks like a big gate. It is quite steep trail from Teacher Zhang’s Guesthouse down to the Middle Rapids. From the Middle Rapids, there are two small trails back to the road. The first one is to climb the Tianti or “Sky Ladder”, which is a challenge, vertical and dangerous climbing. Usually we choose the lower trail and trek to the Walnut Grove Garden. This is a nice trekking along the Yangtze River. Transfer along the Haba Snow Mountain to Shangri-La, visit Baishuitai Terraces on the way. Middle Tiger Leaping Gorge, as the most perilous section, features a huge drop in water level. Six km away from the upper gorge is a waterfall where the river crashes down over 100 meters hitting the rocks in the river bed and creating violent currents. In 100-meter section are numerous reefs, and the current is torrential. The gorge is rarely traversed by humans, but on the slope between the Middle and Lower Tiger Leaping Gorge there is a small village — Hetaoyuan Village, which has little contact with the outside, where villagers lead a simple and natural life, dwelling in stone-plate houses. At noon, visit a Tibetan family to experience the local life and try Tibetan home-made yak and cheese. Free at leisure before be transferred to airport for the departure flight. Service ends.